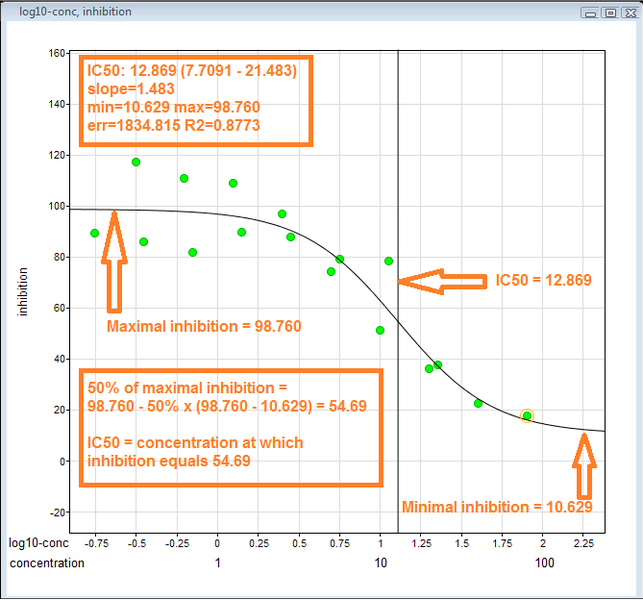 I have just read this post at researchgate: "How to calculate experimental binding free energy from the IC50 value"
I am not be very sure about what the difference is between Ki and IC50. Could anybody explain? In biochemistry the Ki is the dissociation constant of a complex and molecules bound to it. It is a measure for the functional strength of the inhibitor. This can for example be an enzyme and its substrate, the Ki defines the stability of the complex. The Ki plays an important role in the calculation of the IC50, as it defines the strength of the enzyme-inhibitor complex. Not the answer you're looking for? Browse other questions tagged biochemistry enzyme-kinetics or ask your own question. The effect of 3D structure and solubility of the binding site of enzyme on its affinity Km and maximum activity Vmax?